There’s nothing as terrifying as being told your newborn “will be sick a good deal and require special medical and nursing care, which cannot be given at home.” This is what Margaret Harrington from The Unfinished Child was told after her first baby was born in 1947. Though, little Carolyn wasn’t born with any immediately life-threatening birth defect. “I’m sorry to tell you that she is a mongoloid” said the doctor. In 1947, that meant Margaret’s daughter suffered from Down syndrome; and that might as well have been a death sentence. In 2002, Marie is unexpectedly pregnant with a third child. Since she’s thirty-nine, her baby is considered at risk for Down syndrome. Early diagnostic, abortion, raising a challenged child; Marie collapses under the anxiety. To make things more complicated, her confidant and best friend Elizabeth never managed to get pregnant despite years of fertility treatment. How to tell her she is pregnant with a child she didn’t plan, might not want, and might give up if he or she suffers from a genetic defect? As you can see, there is a lot happening in The Unfinished Child. The narration is shared by three characters—Margaret, Marie and Elizabeth—and follows two timelines—one starting in 1947 and the other in 2002. In my opinion, the most interesting theme in the book is the evolution of people’s perception toward Down Syndrome children. The story of Margaret gives insights on how babies born with the genetic anomaly were treated in the past: removed from their parents and hidden in a mental institute where they were neglected, if not even abused. The story of Marie provides a striking contrast: in 2002, she can choose to test her baby for Down Syndrome right in the womb; she can choose to have an abortion and if not, she wouldn’t be looked down on for raising a challenged child, let alone forced to abandon him or her. I really loved how the book show two different relationships to a child based on the social pressure and customs of their time. I was also interested—though horrified—to learn about the treatment of Margaret’s daughter in her institution, the slow evolution of the medical approach to Down syndrome and people’s perception of it. My second favourite theme in The Unfinished Child was the desire for a child and the difficult choices people make in the hope to be a good parent, a good spouse, and a good citizen. Giving away her daughter, a child whom she—but not society nor her husband—wanted to welcome, will haunt Margaret all her life. Marie didn’t plan this third child and struggles with the choices available to her: terminate her pregnancy or not; explain the situation to her daughters or not; face the horrible possibility of “discarding” a baby when her best-friend has tried to have one for years. In the case of Elizabeth, the void this unborn child has left in her life almost entirely defines her. Those three stories throw perspective on one another and make the reader wonders: what would you do? Is the answer that simple? Finally, I found the relationship between Marie and Elizabeth particularly well written and insightful. First, their respective situation give perspective on one another. For instance, how Elizabeth, who’s so frustrated to not be able to conceive, perceive the risk of down syndrome? Second, their story shed light on a real problem: finding a true, reliable friend to talk to when expecting a child. People have strong opinions about what age you should have a child, about disability or abortion, and it can make it hard to open up. The Unfinished Child is also the story of a friendship that is put to the test when Nature seems unfair: giving a child to one who didn’t want it, and refusing it to the other. 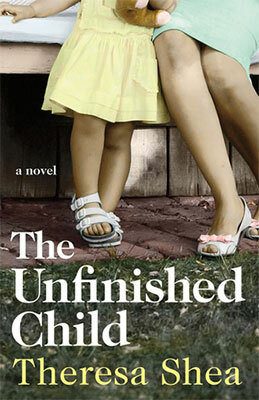 The Unfinished Child gave me a lot to think about, which is another way to say I loved it. I really enjoyed how it gave different perspectives on Down syndrome children, and I especially appreciated the story of Margaret, which gave an overview of how people suffering from Trisomy 21 were (mis)treated in the past, and how it changed through the years. It’s a great novel about tolerance and acceptance. Thank you for sharing you thoughts on this book. I haven’t heard of it, but it sounds very interesting and like it deserves attention because of what it explores about society and Down Syndrome. I really loved this book. It indeed deserves much more attention!